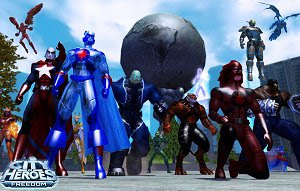 The popular superhero MMORPG City of Heroes is now free-to-play! NCsoft re-launched the game as City of Heroes: Freedom and is offering an impressive amount of content in this game for free. Players can create their own heroes or villains and choose from an outstanding array of costume options, ensuring that no character looks the same. The customizable powers complement the unique personality of each hero or villain. Explore amazing worlds and team up with your friends to fight in amazing battles, exploring thousands of hours of content. Fans of the genre may also try other free superhero MMO games such as Champions Online: Free For All and Marvel Super Hero Squad Online.